Experience Madison, Wisconsin during your stay at Madison's only Capitol Square hotel. The newly renovated Best Western Premier Park Hotel stands as a reflection of Madison's history and growth as a city. A stay this downtown hotel means the best of Madison is happening right outside your window. The Dane County Famers Market, Art Fair on the Square, Concerts on the Square, Taste of Madison, and the Ironman Wisconsin Triathlon are a few of the events that happen on the Capitol Square. 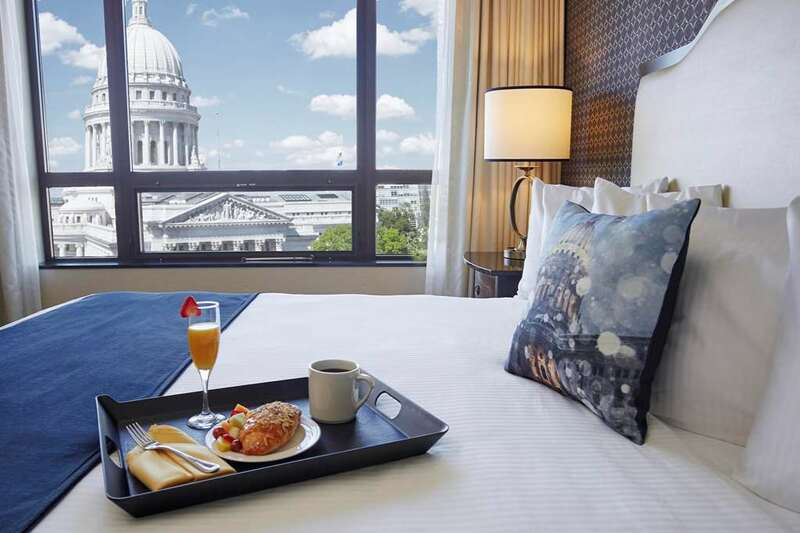 The nearby Overture Center for the Arts, State Street and the Monona Terrace Convention Center, makes this downtown Madison hotel perfect for both business travelers and guests looking for a one-of-a-kind vacation. With the University of Wisconsin's Kohl Center and Camp Randall Stadium nearby, a stay at Best Western Premier Park Hotel makes for an easy game day. Your guest room or suite is well-appointed with everything you need to relax and feel at home after a day of work or exploring Madison. This upscale hotel offers complimentary Wi-Fi, 42-inch flat screen televisions, microwaves, and refrigerators in each room. Start your day with a shower in a marble tiled bath with Kohler Flipside showerhead. When not in the comfortable rooms, enjoy the new on-site restaurant and lounge, indoor heated swimming pool, business center, fitness center and complimentary airport shuttle. Looking for a place to host your next event or conference? The Best Western Premier Park Hotel features 14 flexible meeting spaces including the Top of the Park sky view room and the Hall of Wisconsin ballroom. Enjoy downtown Madison from the only hotel on the Capitol Square. We look forward to seeing you! Pool - Indoor pool, heated pool terrace may be reserved for special events. Poolside rooms available. Herzing College,4.00 mile(s) from Herzing College, was one of the first post-secondary institutions founded to train students for the computer industry. Edgewood College,2.00 mile(s) from Edgewood College, an accredited college offering bachelor's, master's, and doctoral degrees. Dane County Farmers Market,0.01 mile(s) from Dane County Farmers Market, largest producer and the only farmers market in the country! Saturdays April-November on the Capitol Square. Madison Marathon,0.01 mile(s) from Madison Marathon, annually over Memorial Day weekend. Taste Of Madison,0.01 mile(s) from Taste Of Madison, annually over Labor Day weekend on the Capitol Square.